What Happens if I Don’t Pay My Invoice? Your card will be charged for the amount of your hosting plan as well as any overage charges or add-ons each month on the same date that you signed up for service. For example, if you signed up on March 4th you would be charged immediately for your first month, and then on April 4th, you will be billed for your second month. You can add more that one credit card to your account. If you do and we are not able to process your payment using the default card, we’ll retry payment using any additional cards on file. In this way, adding more than one card will help ensure that your monthly payment is processed successfully. Important: Failed payments are not retried automatically and have to be processed manually by our billing department. We will retry your payment using any additional cards on file during normal office hours. We exclusively use Stripe as our credit card processor, we don’t accept PayPal payments. However, for annual plans, we do accept wire transfers or checks. As explained, our billing system automatically renews your monthly hosting subscription on the same day every month. Payments may fail due to insufficient funds, or cards having been reported lost or expired. The most common reason for payment to fail is when a bank simply declines the transaction. If this happens you will need to contact your bank and ask them to allow Kinsta Ltd to process the payment. After the first failed payment attempt we will send an email to the email address you use to log into MyKinsta asking you to work with your bank to ensure payment can be processed successfully. 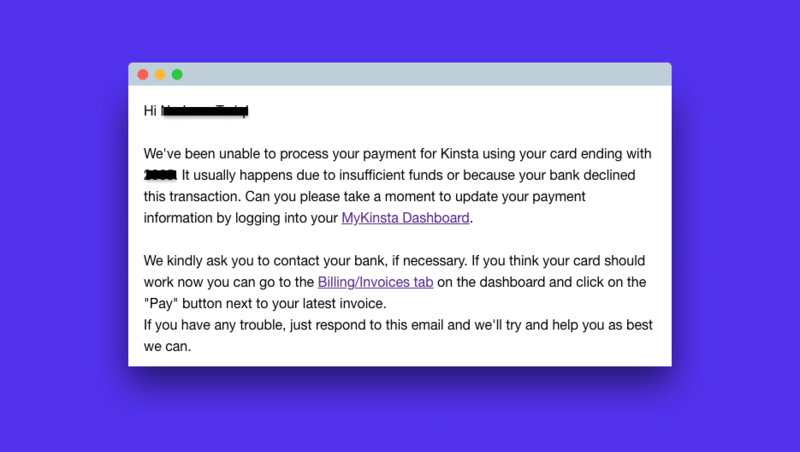 This email is sent to you from the address payments@kinsta.com so please make sure you treat it as high priority and make sure it’s not delivered to your promotions tab or spam folder. If you have an outstanding invoice and wish to retry payment without waiting for our billing system to retry payment automatically you can easily do so by logging into MyKinsta, going to the Billing > Invoices tab and click on the “Pay button next to the failed invoice. If payment is successful you will be able to download a PDF of your paid invoice within a few seconds. 3 days after the first payment attempt fails our billing system automatically tries to process the payment again. 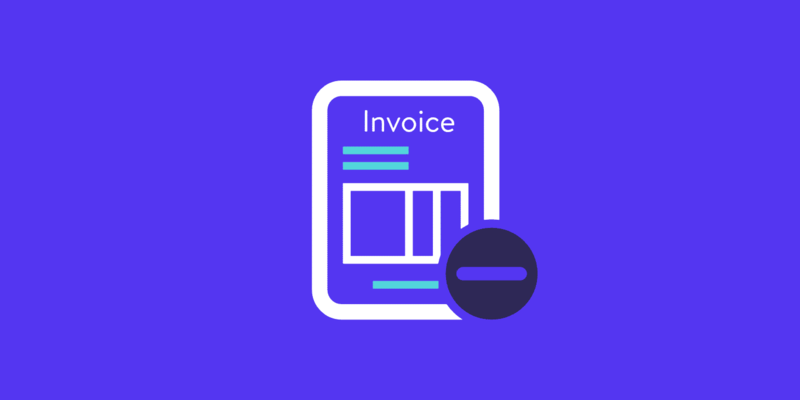 If payment is successful there’s nothing further to do, if payment fails for a second time you will receive a second email letting you know that you have an outstanding invoice which needs to be paid. 7 days after the second failed payment attempt our billing system automatically tries to process the payment again. If payment is successful there’s nothing further to do, if payment fails for a third time you will receive a third email letting you know that you have an outstanding invoice which needs to be paid. 14 days after the third failed payment attempt our billing system automatically tries to process the payment one final time. If payment is successful there’s nothing further that you need to do. However, if this fourth payment attempt fails our billing system will cancel your hosting plan automatically. This will mean that you no longer have an active hosting plan. After the fourth failed payment attempt and subsequent subscription cancellation all of your sites (including both live and staging environments) will be automatically and permanently deleted. In addition, all Kinsta DNS entries and all other data associated with your account will also be automatically and permanently deleted. In short, once an invoice has been unpaid for 14 days the associated hosting plan will be canceled. Following cancellation all data hosted on our platform will be deleted. If you have any issues with your payment please don’t hesitate to contact us during this 14 day grace period by opening a support ticket. We are available 24/7 to help you! Payment for your hosting plan will be charged on the date of signup and then once per year on the anniversary date. For example, if you sign up on March 4th you’ll pay for a full year of hosting and your next plan renewal will occur the following March 4th. Payment for overages and add-ons is processed every month. For example, if you signed up for an annual plan on March 4th and then opted for some add-ons and incurred an overage, the overage and add-ons would be charged to the card on file on April 4th. The 14 day period described above in which payment is attempted four times applies to your annual hosting plan renewal only. Your account won’t be canceled automatically due to failure to pay overage and add-on fees. If this happens we will reach out to you by email and work with you to sort out the issue. However, we do reserve the right to cancel service manually following a suitable warning period if overage and add-on fees do go unpaid.